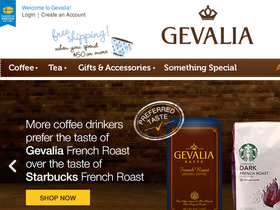 Gevalia Kaffe, online at GevaliaKaffe.com, specializes in coffee and tea, and offers automatic home delivery. Select from over 40 Gevalia Kaffe coffees and teas, or choose a specialty coffee club that is right for you. Gevalia Kaffe also carries coffeemakers, accessories, and gifts. Try delicious seasonal flavors, boutique coffees, and limited edition products at Gevalia Kaffe. Find the best Gevalia Kaffe discounts, Gevalia Kaffe promotions, and Gevalia Kaffe coupons here at RetailSteal.com. Gevalia Kaffe offers $5.95 flat rate shipping on club orders. Returns are allowed within 45 days of receipt. Check site for full details, exclusions may apply. Get a $15 discount on orders of $40 or more from Gevalia when you use this coupon code online. Click to save. Enjoy $20 savings on your purchase of $40 or more when you shop online at Gevalia today. Use our coupon code to receive this discount. Save 10% on your purchase of $60 or more from Gevalia when you use our coupon code online today. Get a free pouch when you purchase the Chocolate Raspberry Holiday Box at Gevalia.com. Take $5 off Gift Baskets and Variety Packs from Gevalia.com. Click link now to shop and save. Buy 3 coffees and get 2 free at Gevalia.com. Click to shop. Find Tassimo coffee for as low as $7.99 at Gevalia.com. Click to shop. Save 10% on tea at Gevalia, for a limited time only. Click link now to save. Shop clearance online at Gevalia.com to save up to 50%! Click link to see selection. Sign up for emails from Gevalia and get a 10% discount. Click the link to start saving.